S.T. 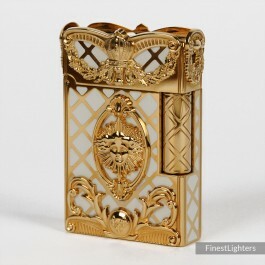 Dupont, drawing inspiration from the splendours of the residence of king Louis XIV in Versailles, created this amazing limited edition lighter, finished in white Chinese lacquer and decorated with golden arabesques and other royal symbols like a golden sun, the emblem of Louis XIV. Launched in 2006, and limited to only 2686 individually numbered pieces.